Professor Youbin Wang is an outstanding member of the Department of Plastic Surgery at Peking Union Medical College Hospital. 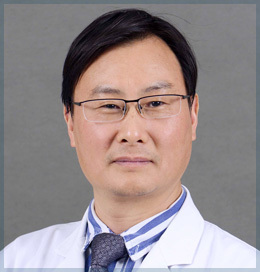 Prof. Wang is a world-renowned and widely published expert in treatment and research in keloid disorder. He is the author of numerous publications in several peer-reviewed and leading medical journals. Since 2010, Dr, Wang has treated over 1500 keloid patients. He has invented several surgical methods that have led to improved outcome for keloid patients. He is well known for his 2010 invention of “double layer continuous intradermal suturing method”. This suturing method has resulted in greater success with the reduction in stitch mark effect and better aesthetic results. He also expanded the concept of keloid epidermis and its use in keloid surgical treatment. He has designed many patterns of keloid skin flap in auricle, face and shoulder keloid surgical treatment such as X-shape skin flap in auricle and two pedicle skin flap in facial keloid surgery, allowing for successful treatment of intractable types of keloid with satisfactory results. Dr. Wang is the first scholar to introduce microsurgery to the field of keloid surgical treatment, putting forward the concept of Pre-cut and Pre-radiotherapy in the treatment of large keloids. He is also the first to explore clinical efficacy of hyperbaric oxygen in the management of keloid patients, thus expanding our understanding of the pathophysiology of keloid disorder. 1 Yun-Qi Liu ，Yi-Fang Liu, Xue-Mei Ma, Yi-Ding Xiao, You-Bin Wang, Ming-Zi Zhang, et al. Hydrogen-rich saline attenuates skin ischemia/reperfusion-induced apoptosis via regulating Bax/Bcl-2 ratio and ASK-1/JNK pathway. Journal of Plastic, Reconstructive & Aesthetic Surgery (2015) 68, e147-e156. 2 Yi-Ding Xiao, Yun-Qi Liu, Jia-La Li, Xue-Mei Ma, You-Bin Wang, et al. Hyperbaric oxygen preconditioning inhibits skin ﬂap apoptosis in a rat ischemiae reperfusion model. Journal of Surgical Research. 199 (2015),732-739. 3 QI Zheng, GAO Chun-jin, WANG You-bin*, et al. Effects of hyperbaric oxygen preconditioning on ischemia-reperfusion inflammation and skin fap survival. Chin Med J. 2013 126 (20): 3904-3909. 4 Ling ZHAO, You-bin WANG*, Shi-Rui QIN, Xue-mei MA, et al. Protective effect of hydrogen-rich saline onischemia/reperfusion injury in rat skin flap. J Zhejiang Univ-Sci B (Biomed & Biotechnol). 2013；14(5):382-391. 5 ZHENG QI, WEIZHONG LIANG, YOUBIN WANG, XIAO LONG, et al. “X”-shaped incision and keloid skin-flap resurfacing: a new surgical method for auricle keloid excision and reconstruction. Dermatol Surg. 2012；38(8):1378-82. 6 Wang Youbin, Xu Jun, Wu Huanwen, Wang Xiaojun*, Wang Zhi. Recurrence of large subcutaneous keloids after tissue expansion: two case reports. J Plast Reconstr Aesthet Surg. 2013；66(2):e58-9. 7 Wang Youbin, Qi Zheng, Wang Xiaojun. Dermis Reconstruction and Dermis Fat Graft Through an Intraoral Incision: A New Method to Correct the Furrowed Philtral Column Deformity in Lesser-Form Cleft Lip.Cleft Palate Craniofac J. 2014；51(2): 3-8. 8 WENBO LI, YOUBIN WANG, XIAOJUN WANG, ZHIFEI LIU. A Keloid Edge Precut, Preradiotherapy Method in Large Keloid Skin Graft Treatment.Dermatol Surg. 2014；40(1):52-7. 11 Youbin Wang and Xiao Long. Double Layer Continuous Intradermal Sutures in Keloid Operation. J Clin Exp Dermatol Res. 2014；5:1. 12 Yi-Ding Xiao, Yun-Qi Liu, Ming-Zi Zhang, You-Bin Wang, et al. Synergistic Effect of Hyperbaric Oxygen Preconditioning and Hydrogen-rich Saline Administration in Protecting Rat Skin Flap from Ischemia/Reperfusion (I/R) Injury by Depressing Apoptosis. Plastic Aesthetic Research. 2015；2（6）:1-7. 13 Zhang M, Xu Y, Liu Y, Cheng Y, Zhao P, Liu H, Wang Y, Ma X. Chemokine-Like Factor 1 (CKLF-1) is Overexpressed in Keloid Patients. Medicine. 2016;95(11), e3082. 14 Xiao Long, Mingzi Zhang, Yang Wang, Ru Zhao, Youbin Wang, XiaojunWang. Algorithm of chest wall keloid treatment. Medicine. 2016;95:35. 15 Ming Bai, Yifang Liu, Dechang Yin, Mingzi Zhang, Youbin Wang, Xuemei Ma, Yunqi Liu, PengxiangZhao.Inhibition of c-Jun N-terminal kinase signaling suppresses skin ﬂap apoptosis in a rat ischemia and/or reperfusion model. Journal of Surgical Research .2016 (206) 337-346. 16 Mingzi Zhang, Kexin Song, Ning Ding, Chang Shu, Youbin Wang. Using a Distant Abdominal Skin Flap to Treat Digital Constriction Bands A Case Report for Vohwinkel Syndrome. Medicine 2016; 95(6):e2762. 18 Zeng A, Song K, Zhang M, Men Q, Wang Y, Zhu L, Liu Z. The “Sandwich Therapy”: A Microsurgical Integrated Approach for Presternal Keloid Treatment..Ann Plast Surg. 2017 Sep;79(3):280-285. doi: 10.1097/SAP. 0000000000000975.